The Silk Road YTL9383 not only offers the stability needed to take the perfect picture but the patent pending Y-Tube centre column design is 30% more compact when folded compared to a similar sized tripod. This versatile tripod features robust aluminium construction, an easy lever leg locking system and foam hand grips. Add to that a 3D centre column, graduated leg markings, 3 leg angle adjustment positions and a screw thread that converts between 3/8" and 1/4" and you have to ask "Y hasn’t anyone thought of this before?" The centre column on the YTL9383 brings a different dimension to tripod design – allowing legs to be stowed in a much more compact way, without the ‘bulk’ of tripods that use a traditional circular centre-column. The legs are constructed from die-cast aluminium, with galvanised steel screws to allow the product to be robust and durable over a long time period. You can be confident that if looked after properly your tripod will perform superbly for years. The YTL9383 will support a maximum weight of 8kg making it ideal for a range of DSLR and lens configurations. The ‘Y’ shaped centre column has the added benefit of reducing both the size and the weight of the tripod whilst providing the same camera support that users expect. The overall space saved equates to about 30% verses a traditional design, saving you room in a gadget bag or lightening the overall load that you carry. The tripods versatility is further enhanced by the addition of the 3-D centre column function which allows you to remove the centre column from its vertical position, rotate it through a 180 degree angle and lock where required. This combined with the variable leg angle settings makes this tripod ideal for a wide range of photography. The 3D centre column can be moved through a 180-degree arc, giving even more creative flexibility to the user. This model also includes a low angle adaptor as part of the tool kit so you can fully remove the column and get extremely low to the ground. These features can often prove helpful for macro or still-life photography where the camera needs to be positioned closer to the subject. The tripod can be set as low as 20cm for fantastic versatility in use. The column includes a useful hook on the bottom to hang a bag (or likewise) off to gain a bit of extra stability too. The three leg sections extend to a maximum height of 151cm (without centre column extended) or 183cm with the centre column raised. Consider this alongside a choice of three leg-angle positions (low, medium and high) and a centre column that can be reversed and you have a really flexible working solution for all types of photography. The YTL9383 features quick action lever leg locks to make set up quick and easy. These can also be individually tensioned with an allen key (included with the kit) if necessary. It has graduated markings on the lowest leg sections to aid when setting up the tripod at less than full extension. The Giotto’s Silk Road YTL9383 is a very versatile tripod and will suit a variety of photography types. 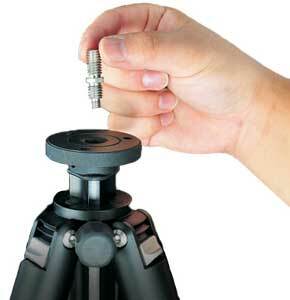 The head mounting thread on the tripod can be switched between 3/8 and 1/4 inch easily. This allows a wide range of heads from both Giotto’s and other manufacturers to be fitted if required. 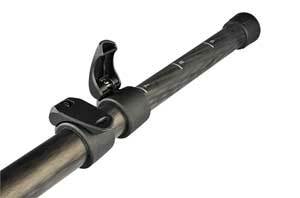 Foam grips on the top of each leg section mean that repositioning of the tripod is comfortable and the quick release locks allow the leg angles to be adjusted independently on each leg for use on uneven terrain or for low level use. The whole unit folds up to only 68cm and weighs just 1.88kg making it a popular choice due to it’s versatility and compact shape being so easy to use.